You may have heard of WolframAlpha: an app (and website) which lets anyone compute and work with all sorts of data. It's actually used by Apple's Siri for looking up lots of information (when it can't find anything relevant on Bing), and it can be extremely useful for math homework, sports trivia, or all sorts of other random stuff. What you might not know is that the Wolfram engine is also used for serious computational work: it is used by many physicists and mathematicians for demanding simulations, symbolic calculations, and even some pretty animations. Despite being more suited for theoretical work, it is also possible to use Wolfram's programming language for professional software development. However, until recently, the only way to do so was using Mathematica, Wolfram's desktop application, which could easily set you back a few hundred dollars. Fortunately, since the Wolfram Open Cloud launched last month, it is now possible to take advantage of all the computational power of the Wolfram engine using nothing more than a web browser and a free Wolfram Cloud account. 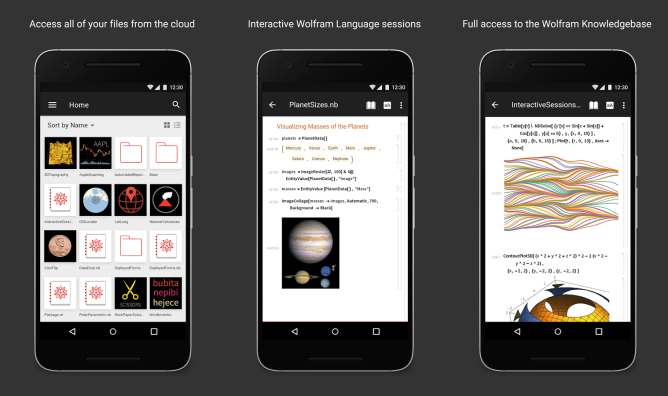 Today, Wolfram has released an Android app of Wolfram Cloud on the Play Store, making it even easier to do intense computations on the go. And since all the heavy lifting is done on Wolfram's servers and not on your underpowered mobile CPU, doing serious work doesn't have to mean draining your battery in half an hour either. If you want to play around a bit with Wolfram Cloud, go ahead and install the app from the widget below. Even if you've got a limited amount of programming experience, the documentation center provides plenty of examples to get you started. A free account allows you to do just about any kind of casual program you can think of, but if you want to do some more serious work and find you need access to some more storage or computing power, you may need to upgrade to a paid account.